Sorry for the delay, but we now have information about the cruise that jane and I are putting together for the spring 2011. The dates are Sun. March 12-19, leaving Ft. Lauderdale on the ms Eurodam. Stops are Grand Turk, San Juan, St. Thomas, and Half Moon Cay. It is reccomended to get to Lauderdale the day before to avoid problems with the weather. 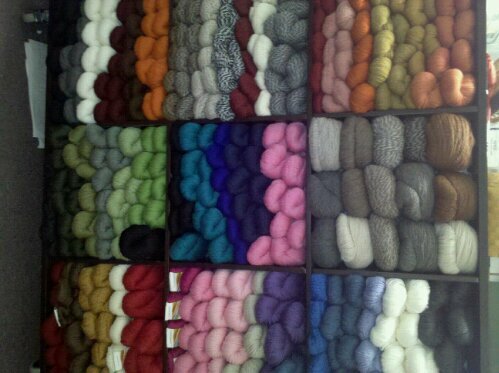 We maybe able to do a yarn shop crawl if people are interested. Cost is $1129. per person and includes: all meals. all shipboard facilities, transportaion from the airport to the ship, port fees and government fees. Liquor, spa and excursions are extra. This amounts also will reserve a classroom for us to use at any time during our trip. Jane and I will offer 2 0ne-day workshops(while we are at sea) which are included in this cost, however material will be extra. We will also be avaiable during the evenings for open knitting and any help you need us. The classroom will hold 30 people. The earlier you make your reservation the more likely you will qualify for an cabin upgrade. Make your reservation through Craft Cruises- 1-877-972-7238, and say that you are with the mass. ave. trip to the Caribbean. Payment schedules can be arranged through Craft Cruises. Hopefully we can make the an annual or bi-annual event! If you have questions please call the shop (317-638-1833)and talk to susan or jane (317-894-6548 home). We will hopefully have more info soon about flights. DONT’ FORGET THAT THE SHOP WILL BE CLOSED NEXT WEEK (Aug 16-22). We will reop on Mon. Aug. 23. Sorry for the mixup, I was trying to send pictures, so here they are! 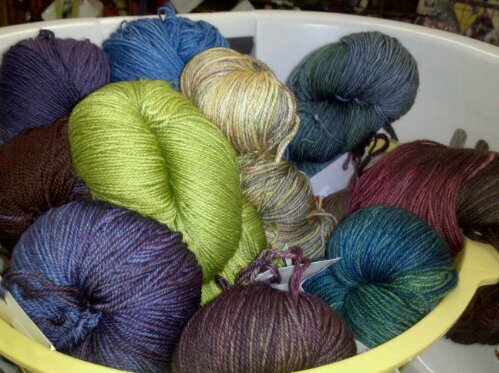 The first picture is the Rasta, next is the sock yarn , Rios, and new cascade 128 superwash and 220 yarn. 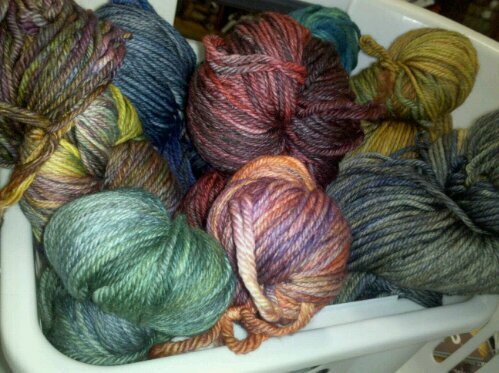 Malabrigo came in and OMG!. (I am so hip)! Anyway, I am suppose to be putting the inventory in the comp., but I had to let you know about the new yarns from malabrigo. 1. Rios- is a heavy worsted weight machine washable wool. The colors are amazing. I have around 15 colors in stock! 2. Rasta- is a very chunky wool (2-1.5 sts= 1″). This is a very fast knit and we have some great colors. I am going to knit up a fast hat, but I already have a little womens sweater that I knit out of 2 balls! I think this will be a great seller this fall! Malabrigo 2 book is also in stock! 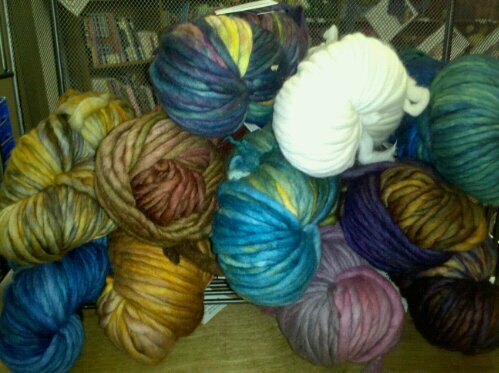 The new Rowan yarns are in stock as well as tahki and Gedifra. Don’t forget that this weekend is Lace Club. Sat. 12-3 open lace knitting. no charge. Also, don’t forget that we will be closed the week of August 17. We will reopen the following mon.